The first time I remember being on a two-wheeler was on a bajaj chetak. Older than me and still doing duty for office people this scooter has done its duty with dignity and obidience. Never has it failed us. The news came to me as a shock when I read the article that Bajaj has discontinued Chetak since Decemeber 2005. Never has a vehicle sold so much and never it will. For me it has more value than the ambassador. I will try to see to it that we keep our Chetak as long as possible. Thats sad news! Even sadder that the legend died such a quiet death. Chetak deserved a better send off then what it got. Ah the Chetak. This was also my introduction to scooters. It is still showing on the Bajaj web site. http://www.bajajauto.com/1024/vehicl...ehvariation=01 I guess they have a few to sell until March. Any idea what they are going to replace it with ? Last edited by bigman : 3rd March 2006 at 21:13. No idea but certainly something better with a 4-stroke engine. Even the 4 stroke engine could'nt save the Chetak. Funny thing is Honda launched a Chetak Clone the ETERNO and its going good, so you cant say the side engine scooter market is dead. Last edited by wheelieboy : 4th March 2006 at 17:30. ITs surprising to say that even after so many years our chetak is returning FE figure of 40-45kmpl. being just 2-3 months older than me, I have special memories attached with our chetak. Bajaj should bring out a new 4-s scooter with the same name. It has served millions of ppl and i guess its graceful exit was due for sometime. It is a legend no doubt in the indian 2 wheeler context epitomising the " Hamara Bajaj" slogan..
[Sniff] can any1 please post pics of this great 2-wheeler. I am sure no 2-wheeler must have outsold this chetak of ours. One lazy saturday afternoon, a couple of friends were talking about good old days and the cars and bikes of those days. One friend quoted that Bajaj has stopped production of Scooters. Suddenly, I remembered the old ads that were shown on Doordarshan in the ’80s. One particular ad was the most remarkable one of those years - Hamara Bajaj. “Hamara Bajaj” had a universal appeal. It was filled with elements that made the scooter seem like a commodity that everyone in the family treasured. Most middle class children in India in 70's and 80's would have been literally brought up on it. And that phrase captured all the sentiments of India as a whole, a complete era gone by captured by one symbol - ‘Hamara Kal, Hamara Aaj, Hamara Bajaj‘. The scooter was common man's companion through his success and failure, diligently negotiating the twists and bumps on two small wheels, shouldering responsibilities much beyond its capacities but seldom complaining. The scooter was a reliable workhorse and served the master whole heartedly. Also it was perfect for those ‘complete family of Hum Do Humare do’ rides, when car was a luxury much beyond the common man’s reach. 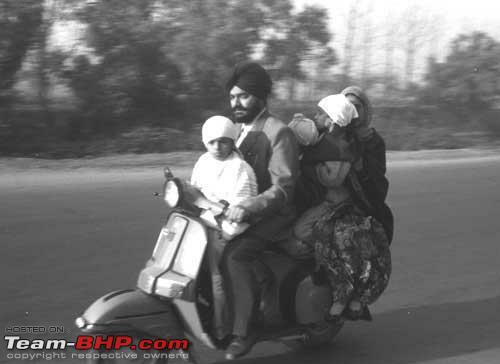 People used to pay premium for booking a Bajaj those days. A scooter was also preferred marriage gift and was also a prestige symbol. And having done its job, our friend and companion for three complete generations is now gone. But the scooter will always remain - Hamara Bajaj. Illustrative image taken from Internet. slightly OT,but I'd say my Bajaj Super,which served me for five years,will forever remain my lifetime favoutite machine.The fellow returned 48-50kmpl consistently throughout. Maintenance - 350ml gear oil every 5000 kms,two clutch cables(inner only), two gear cables(inner& outer) and air inlet bellow replaced.That is all. Even the carb was not cleaned in 15000 kms . and I sold the machine for just Rs.3500 lower than I had purchased. There's no way this record can be beaten. Bajaj Chetak - what a scooter! The last few models which were two-stroke and had electronic ignition were the best of the entire series. The Chetak had everything but stylish looks. The LML 150 NV beat it on the looks front. Well, I was always a LML fan. Their scooters handled better and did not squeak and rattle like the ones from the Bajaj stable. I've ridden pretty much all models of Bajaj scooters manufactured in the late 80s (Super, Chetak, Priya) but always preferred the Vespas. One of the first things you had to master with the Bajaj scooters was the 'tilt right - straighten and kick' trick. Also, they had a tendency to pull to one side if you braked hard. One of my friends landed face first in the gutter when he stomped on the brake pedal on his dad's scooter.